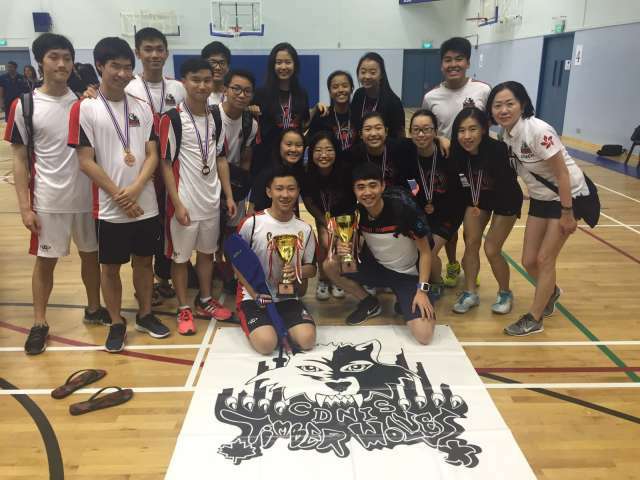 Over the March 18-20 weekend we 54 SEASAC Athletes competing in Badminton (Singapore) Softball (Jakarata) and Gymnastics (Singapore). As always, our athletes made CDNIS very proud, not only with their outstanding results but with the way they played their games at represented our community. Thanks must go to our wonderful volunteer Coaches Wright, Glazier, Kirchner, Man, Schmalenberg, Atherton, Sharmaine, Dean, Aimee, Tiffany and ATC Ngan. It was also great that a number of parents made the trip to support the teams. A brief recap of the teams performances is below with photos too. Badminton is one of CDNIS’ strongest sports. Our teams went to Singapore with clear goals and these were achieved as a result of supreme skills and a good dose of courage. Our Girls team made the semi finals and ended up playing for Bronze v Bangkok Patana School. BPS are also a strong team and had beaten us 2-3 in the round robin. Our #1 #2 and #3 singles game out super strong and had the Bronze medal secured for CDNIS by the times are doubles teams secured the 5-0 victory. Congratulations on a Bronze SEASAC Medal. (one place better than 2015). Our Boys were dominant in the round robin play and qualified 3rd into the Semi Finals. In the 3rd place play off we faced home team UWC Dover who had a vocal team of supporters roaring them home. However our boys stayed strong and claimed a great 3-2 victory and return to the podium for the first time in 3 years. Great to see both teams improve on their results from 2015 and both teams were proud to be SEASAC medal winners. Our Softballers were itching to play SEASAC softball after only practicing for the last 5 weeks due to no local games for the Boys team and only one tournament for the Girls team. They started hot (literally it was 40 degrees + in Jakarta) with our Girls winning 4/5 in pool play and our Boys team recording their first ever SEASAC Softball victory, quickly followed by their second ever SEASAC Softball victory. This was enough to have both teams qualify for the Semi finals which was our first goal. Unfortunately thunder and lightening meant the semis were cancelled on the Saturday afternoon. This was good news for the Girls Team who went straight through to the final, but tough for our Boys who had qualified 4th and so missed out on the final and played for 3rd on Sunday. The Boys ended up 4th which is still our best result in SEASAC Softball, special mention to Rentaro and Henry who combined for 17 home runs in the tournament. The Girls played the Final v MKIS and it was a real battle. We were down 1-2 in the last innings with the tieing runner on 3rd base. MKIS pulled a fantastic double play and the match was over, our TWolves finishing a very creditable 2nd place in SEASAC. Two great results for our programme which continues to grow. Big things are expected in 2017 SEASAC Softball. Our Team of 12 elite Gymnasts travelled to the fantastic facilities of UWC East to compete in Senior Gymnastics. Level 5-6 Gymnasts are real athletes and great to watch. Despite one of our 3 male Gymnasts breaking an arm on the parallel bars (poor Arris) we had really great success from our Boys Team. Michael won SEASAC Medals on the High Bar (Silver MAG 3) Parallel (Bronze MAG 3). Jameson competed at the very highest level of SEASAC – MAG Level 6. He won Gold All Round and performed with distinction. Megan won Bronze on Floor (WAG 6) and also did well on uneven bars. We are proud of the performance of all our gymnasts, many of them placed in the top 10 of the All Round Competition. Most of our team will be in the same level in 2017 and if they continue with their committed training regime will be strong contenders in Level 5/6 next year.